Blues Angel Music was founded in Pensacola in 1997 by retired Navy Captain and fighter pilot Jim DeStafney. 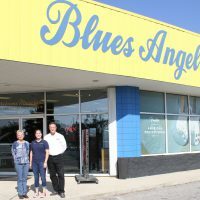 He and his wife Nan, a retired Navy forensics officer, have grown the store from its one-man, 1,000 square foot beginnings into a 15,000 square foot, full-line music store, complete with a fully-staffed school of music. The store has always been a family affair with their son Stephen. Their daughter in-law Sierra, who is also now part of the team, along with Nan, have been participating in the Florida SBDC at UWF’s Small Business Management (SBM) Program, an intensive, nine-month course offering comprehensive business education, peer-to-peer interactions, and ongoing business consulting. Stephen is working on his business degree at UWF, but Nan says their involvement with the SBDC is important too. In terms of the company, Nan states she has the vision for where it’s going, and Stephen is the implementer. To take it a step further, she says what’s even better is the follow up with one on one time to see where YOU are. "[Our consultant] meets you at the point of YOUR need, not just Business 101, because all of the businesses in the program are so different. Not only do you get what’s common to all businesses, like operations, sales, marketing and all that, but you have the face to face time too. "